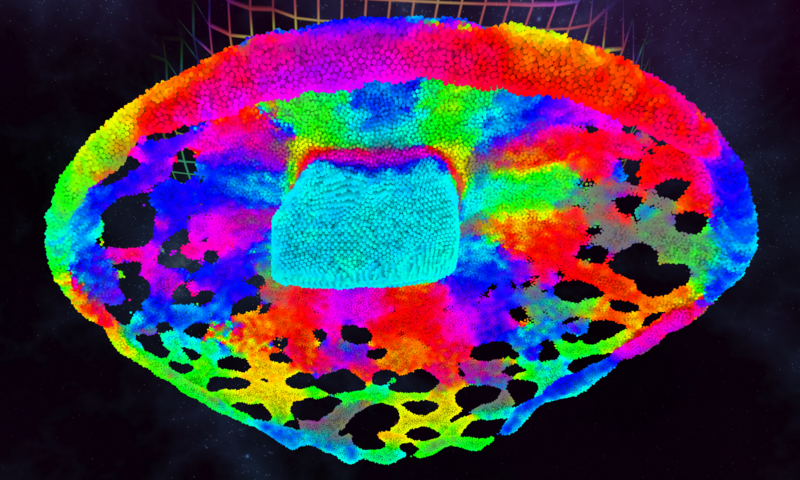 Chroma Lab is a VR particle physics sandbox. Surround yourself with hundreds of thousands of colorful particles that behave like a fluid which you can interact with using a variety of tools. Chroma Lab is based around a high performance, built-from-scratch, particle physics engine that utilises the vast computing power of modern GPUs to calculate billions of individual forces per second, necessary for the particles to interact with each other and behave like a fluid (AMD Radeon and Nvidia GTX cards both work). I am the sole developer of Chroma Lab, it’s development started last september after being inspired to learn compute shaders after seeing GPU cubes VR (Psyia) by Lachian Sleight (/u/mptp) and Jelly in the Sky by /u/Zolden. It started off as an experiment to further my knowledge and as I improved it and fixed bugs I realised it could be a compelling experience. Chroma Lab is my first game. I first started games development in January of 2016, in anticipation of getting my Vive and doing it as a hobby. Another interest of mine is computer hardware which has helped significantly with shader programming and optimisation. Otherwise I live in the UK and have recently graduated with a masters degree in electrical engineering. A large part of Chroma Lab was developed in my spare time while at Uni however the last few months I have been working on it full time.